An article published in the journal “Geophysical Research Letters” reports evidence of rainfall on Titan, the largest of Saturn’s moons. A team of researchers led by Rajani Dhingra, a doctoral student in physics at the University of Idaho, examined images captured by the Cassini space probe, finding an anomaly at the north pole of Titan interpreted as a methane rain. This is an indication of the beginning of summer in this moon’s northern hemisphere. In particular, it’s an image captured on June 7, 2016 by the Cassini space probe’s Visual and Infrared Mapping Spectrometer (VIMS) instrument that raised the interest of Rajani Dhingra and her colleagues because it showed a reflection outside the normal near Titan’s north pole. This phenomenon covered a very large area, about half of the American Great Lakes, and was short-lived so it wasn’t found either in the images previously captured by Cassini nor in the ones captured later. An analysis of the image suggests that sunlight is reflected by a wet surface. The researchers attributed it to a methane rain, which was followed by a period of evaporation. 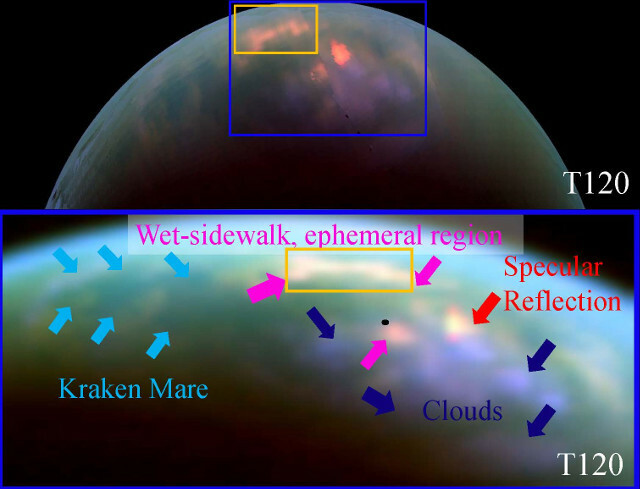 If that interpretation is correct, it’s the first observations of a summer rain in Titan’s northern hemisphere. The image (NASA/JPL/University of Arizona/University of Idaho) shows on the top Titan’s northern hemisphere and on the bottom the polar area seen by the Cassini space probe’s VIMS spectrometer. The orange rectangle shows the reflective area interpreted as evidence of methane rains. The dark blue arrows markindicate clouds. The red arrows mark the reflection from a lake called Xolotlan Lacus. The pink arrows mark the region compared to a wet sidewalk. The black dot marks the north pole. The light blue arrows mark the edges of the largest polar sea, Kraken Mare. Every season on Titan lasts about seven Earth’s years and Cassini studied it for the first time when it was summer in the southern hemisphere observing there various methane rains. The researchers expected something similar in the northern hemisphere as well but they didn’t even see clouds, a lack that caused perplexity. This research could change the situation. Further analysis suggests that methane rain fell on a pebble-like surface based on the pattern of methane that settled on the surface. It seems that the effects of the summer came later than expected and Rajani Dhingra stated that it will be necessary to understand why. The mission of the Cassini space probe ended on September 15, 2017 with its destruction in the atmosphere of the planet Saturn but the wealth of data collected – including those on Titan – keeps on being examined. Seasonal cycles, clouds, dunes, rains and more on this moon make it strangely familiar and understanding these phenomena also helps to better understand the complex chemical reactions that can lead to the formation of life’s building blocks.